Diffuse gas and dust in the heart of the Carina Nebula. The bright star is Eta Carinae, a massive double star at the end of its live that will soon explode as a supernova. The “Keyhole” is the dark cloud in the centre of the image. 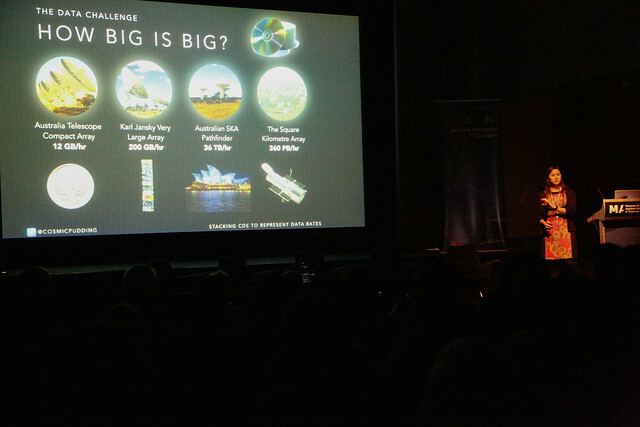 Image obtained as part of the “ABC Stargazing Live” events at Siding Spring Observatory (NSW, Australia), 4 – 6 April 2017. 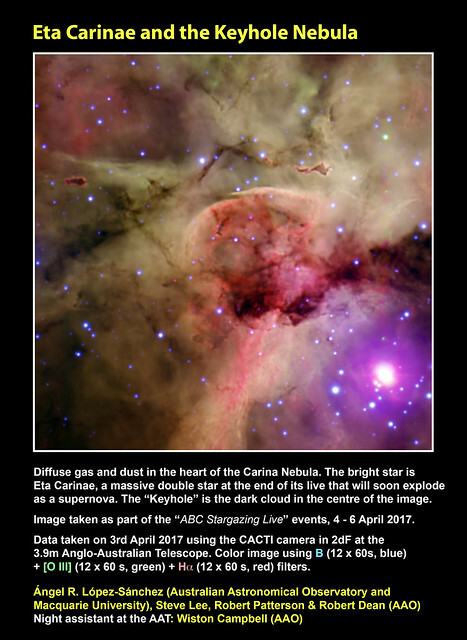 Data taken on 3rd April 2017 using the CACTI camera in 2dF at the 3.9m Anglo-Australian Telescope. Color image using B (12 x 60s, blue) + [O III] (12 x 60 s, green) + Hα (12 x 60 s, red) filters. 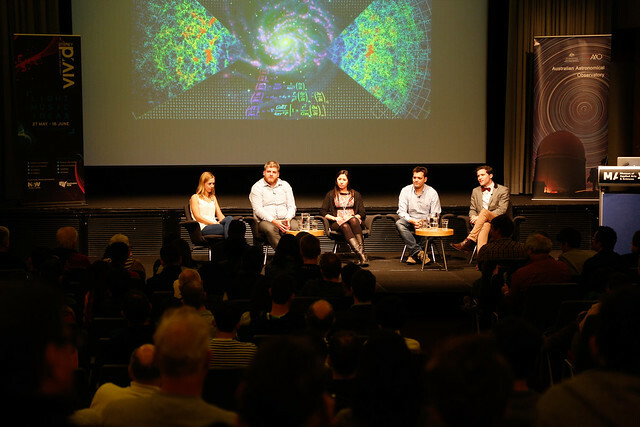 Credit: Ángel R. López-Sánchez (Australian Astronomical Observatory and Macquarie University), Steve Lee, Robert Patterson & Robert Dean (AAO), Night assistant at the AAT: Wiston Campbell (AAO). The supernova SN 1987A, that exploded in the outskirts of the Tarantula Nebula (1) in the Large Magellanic Cloud (LMC) on February 23rd, 1987, was an unique a rare event that still puzzles astronomers and theoretical physicists. 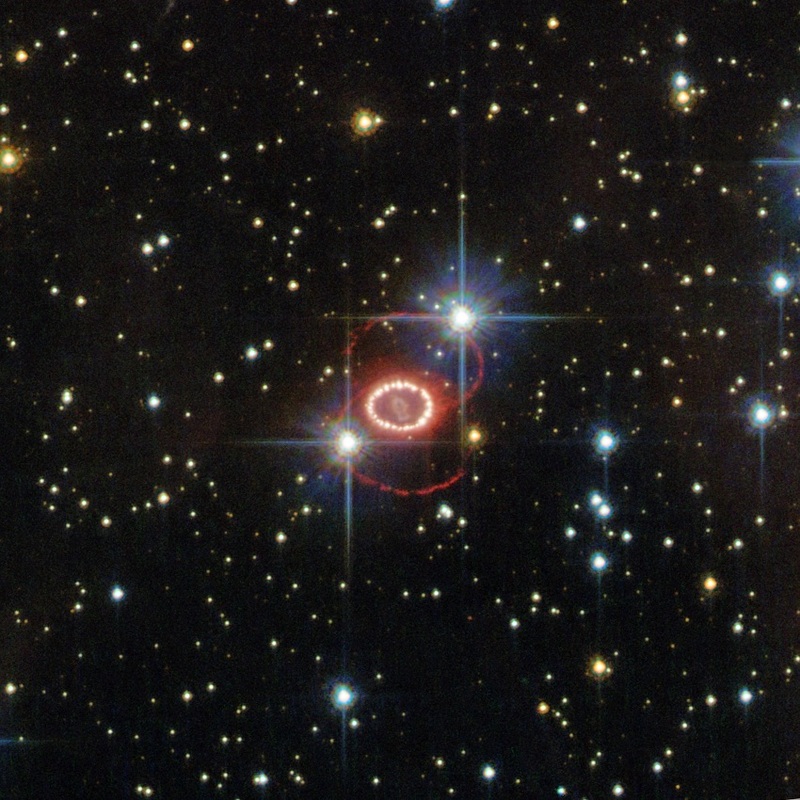 SN 1987A originated by the core-collapse of a very massive star, hence it was classified as a “type II” supernova (2). SN 1987A provided astrophysicists the very first opportunity to study the behavior and evolution of a supernova in detail. Among other things, SN 1987A was the first supernova for which the progenitor star was identified on archival photographic plates, permitted the first direct observation of supernova nucleosynthesis (including accurate masses of 56Ni, 57Ni and 44Ti), the first observation of the dust in a supernova, the first detection of circumstellar and interstellar material around a supernova, and, importantly, the first detection of neutrinos coming from the core collapse of a massive stars. Figure 1. Supernova 1987A after exploding in February 1987 (left), and an image taken before the explosion (right). Credit: David Malin / Australian Astronomical Observatory. 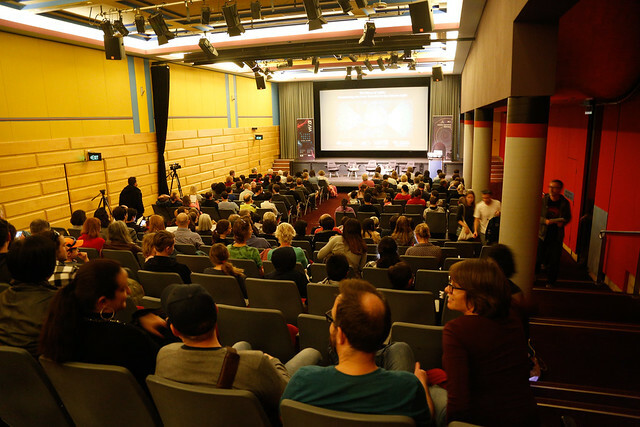 Commemorating the 30th anniversary of this very rare event, we at the Australian Astronomical Observatory (AAO) have published today a new media release about it. 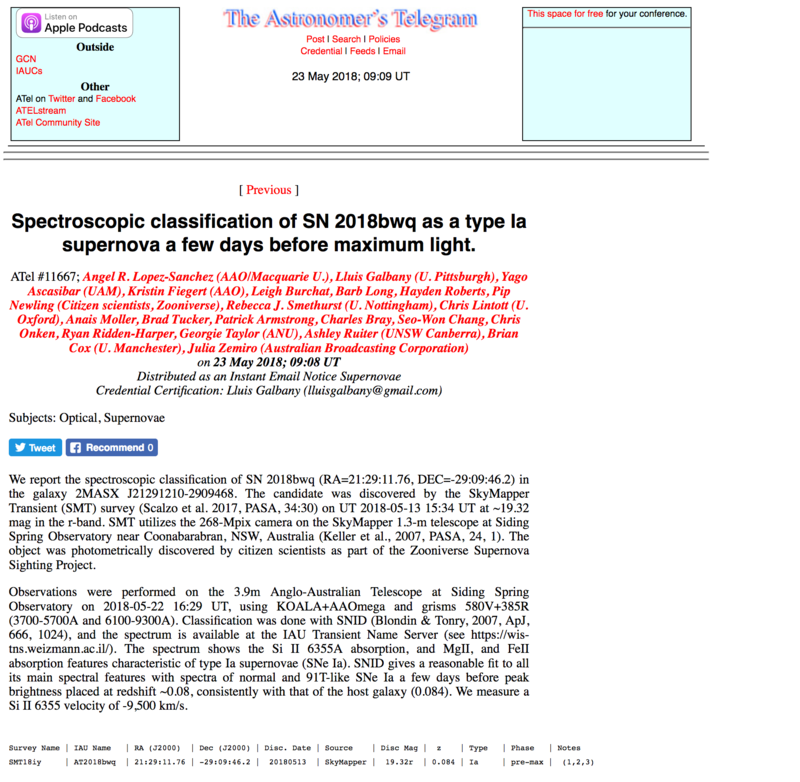 In this post I extend this media release providing a kind of review of what it has been the study of the SN 1987A. Although the light from SN 1987A reached Earth on February 23rd, 1987, it was discovered at ~23:00 UTC February 24th, 1987 (~10am Feb 25th, 1987 in Sydney time) by astronomers Ian Shelton and Oscar Duhalde using the 10-inch astrograph (also seen by the naked eye) at Las Campanas Observatory in Chile. Within few hours it was also independently identified by amateur astronomer Albert Jones (who has one of the highest records of observing variable stars, more than half a million measurements during his life) from New Zealand. Figure 1 compares the view of this region of the Tarantula Nebula using the Anglo-Australian Telescope (AAT) after (left) and before (right) the star exploded. SN 1987A is located at approximately 168,000 light years from Earth. It was the closest observed supernova since famous Kepler’s Supernova (SN 1604), which occurred in the Milky Way itself in 1604. Although SN 1987A could be seen only from the Southern Hemisphere because its location in the famous Tarantula Nebula (Figure 2) within the Large Magellanic Cloud, and it was visible to the naked eye during months. 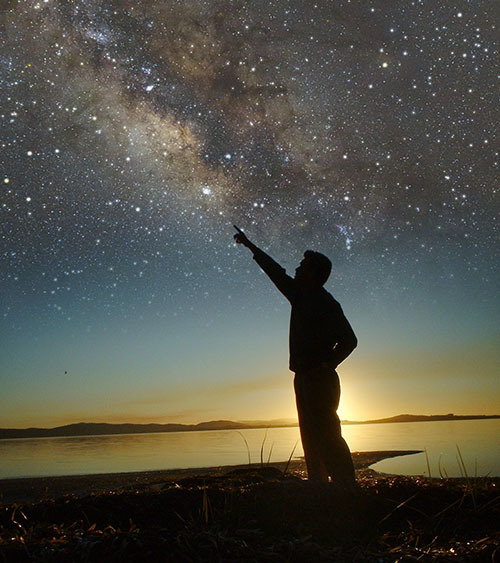 Its brightness peaked in May, when it reaches an apparent magnitude of about 3, meaning it was within the 300 brightest stars in the sky at that moment. Figure 2: The Tarantula Nebula loom to the upper left of where the star Sanduleak -69° 202 exploded as supernova 1987A. Three-colour image made from BGR plates taken at the Anglo-Australian Telescope (AAT) prime focus Credit: David Malin / Australian Astronomical Observatory. The first confirmation of the position of the SN 1987A came from Robert McNaught from Siding Spring Observatory (SSO, Australia) using the University of Aston Hewitt Satellite Schmidt camera. Within four days after the discovery the progenitor star was tentatively identified as the blue supergiant Sanduleak -69° 202. This was later confirmed when the supernova faded, as Sanduleak -69° 202 having disappeared. The progenitor star of SN 1987A had around 20 solar masses, a diameter around 40 times larger that our Sun, and had a spectral and luminosity type B3 I. However, the chemical composition of the progenitor star was very unusual (particularly, the abundance of helium in the outer layers of the star was more than twice larger than expected, as if part of the material of the core, where helium was produced, was somehow mixed into the outer layers). 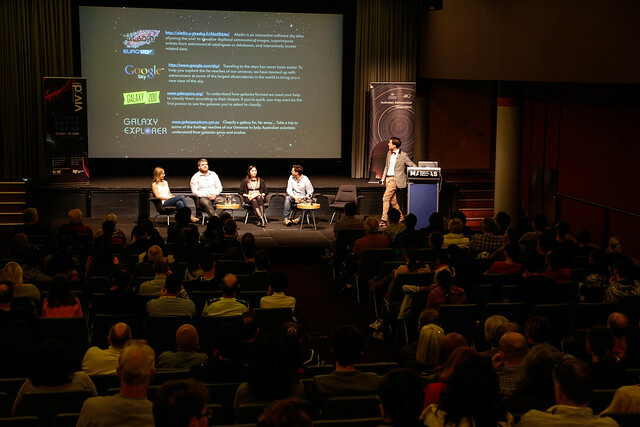 Once alerted to news of the supernova in February 1987, astronomers and engineers working at the Australian Astronomical Observatory (AAO) immediately devised plans for how to make the best observations with the Anglo-Australian Telescope (AAT). 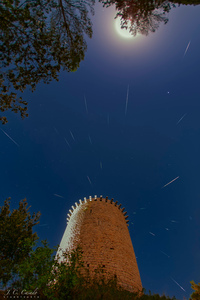 Observing the supernova became a top priority for the next three weeks, the assumed time that it would remain bright. 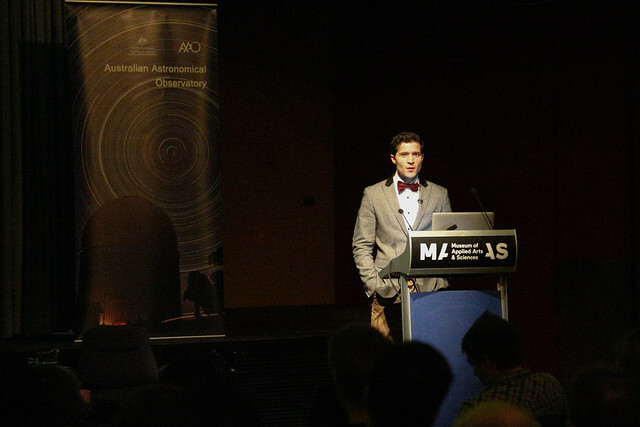 But just in case the supernova continued to be visible, AAO’s Peter Gillingham rapidly assembled a very high resolution “Wooden Spectrograph”, since no telescope in the southern hemisphere at the time had this type of technology available to take advantage of observing such a rare, bright supernova. With luck, Supernova 1987A remained observable for several months after it exploded. 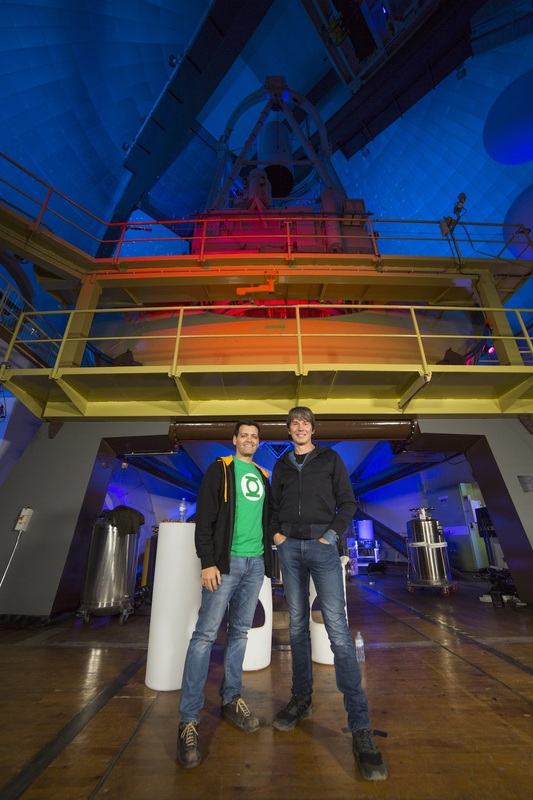 High-spatial resolution observations using cameras at the Anglo-Australian Telescope and the Cerro Tololo International Observatory independently found a “mystery spot” close to the supernova. This was another indication of the broken symmetry of the SN 1987A. Furthermore, the spectroscopic evolution of SN 1987A provided further evidence of the asymmetries in the explosion. Figure 3. Image of the peculiar remnant of the SN 1987A as seen using the ACS camera of the Hubble Space Telescope. Two glowing loops of stellar material and a very bright ring surrounding the dying star at the centre of the frame are clearly identified. All together form an structure named “Hourglass” that still is not fully understood. The field of view of this image is 25×25 arcseconds. Credit: ESA/Hubble & NASA. In 1994 images obtained with the very new Hubble Space Telescope (NASA/ESA) revealed the unusual remnant of SN 1987A (Figure 3). It consists in three rings aligned along an axis of symmetry, giving it the shape of an hourglass. The rings are dense regions in the stellar wind that were ionized by ultraviolet radiation from the supernova. The asymmetry of the SN 1987A remnant implies that the progenitor star was either spinning rapidly or was orbiting a companion star. However, it is important to clarify that these rings are material ejected by Sanduleak -69° 202 tens of years before it exploded as supernova, but later ionized by the explosion. Interestingly, as the rings weren’t seen till the light of the explosion reached them and the size of the inner ring (that has a radius of 0.808 arcsec) was known, astronomers were able to use trigonometry to accurately calculate the distance to the supernova, that turned to be 168 000 light years. 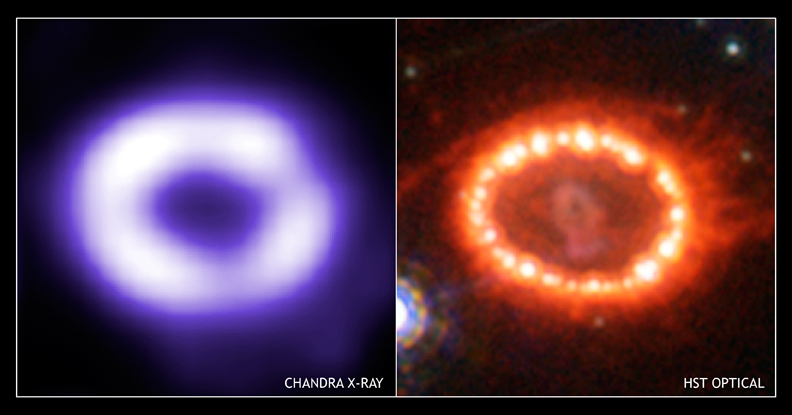 Figure 4 shows the intense generation of X-ray emission when the expanding supernova ejecta, that was moving at more than 7000 km/s, collided with the inner ring of the SN 1987A remnant between 2001 and 2009. This collision also induced an increasing in the optical light emitted by the supernova remnant during this time. A timelapse movie of the images obtained with the HST between 1994 and 2009 (Figure 5) shows the collision of the expanding material with the inner ring. It is predicted the inner ring will disappear between 2020 and 2030 after the shock wave destroys the clumps of material within it. Figure 5: A time sequence of Hubble Space Telescope images, taken in the 15 years from 1994 to 2009, showing the collision of the expanding supernova remnant with a ring of dense material ejected by the progenitor star 20,000 years before the supernova. Credit: Larson et al. 2011, Nature, 474, 484. SN 1987A was an unusual supernova in many aspects. The optical light curve of SN 1987A (Figure 6) was rather different from the one previously observed core-collapse supernovae. Astronomers expected that the progenitor stars were red supergiants with extended envelope, but Sanduleak -69° 202 was a blue supergiant. Furthermore, the way the ejecta of the supernova mixed induced changes in the expected light curve of SN 1987A. As a consequence, the old models of spherical explosions had to be revisited to include density inhomogeneities in the stellar structure. Figure 6: Light curve of SN 1987A over the first 12 years. The figure marks some of the most important events in the history of the supernova. 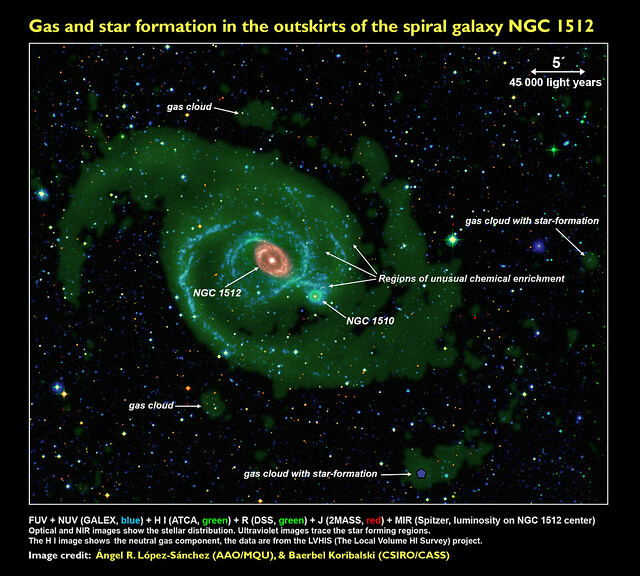 Credit: ESO, figure extracted from Leibundgut and Suntzeff 2003. 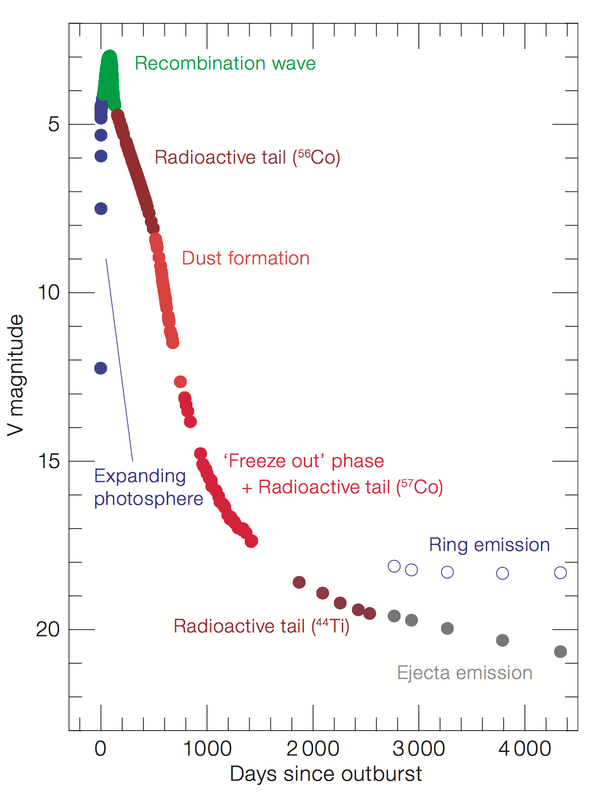 Of special importance, SN1987A provided the first chance to confirm by direct observation the radioactive source of the energy for visible light emissions by detection of predicted gamma-ray line radiation from two of its abundant radioactive nuclei, 56Co and 57Co. This proved the radioactive nature of the long-duration post-explosion glow of supernovae. In 2007 astronomers Thomas Morris and Philipp Podsiadlowski presented simulations which support the hypothesis that the merger of to stars generated the triple-ring system around SN 1987A around 20,000 years before the explosion itself. The two stars were a 15-20 solar mass red giant star and an 5 solar mass star. This would also explain why Sanduleak -69° 202 was a blue supergiant and other peculiarities such as its very strange chemical composition. Interestingly, several “light echoes” (the light emitted by the supernova at its brightness peak reflected of interstellar sheets between the supernova and us) have been observed around the supernova over the years. Figure 7 shows another David Malin’s (AAO) image obtained at the AAT where two “light echoes” are seen. 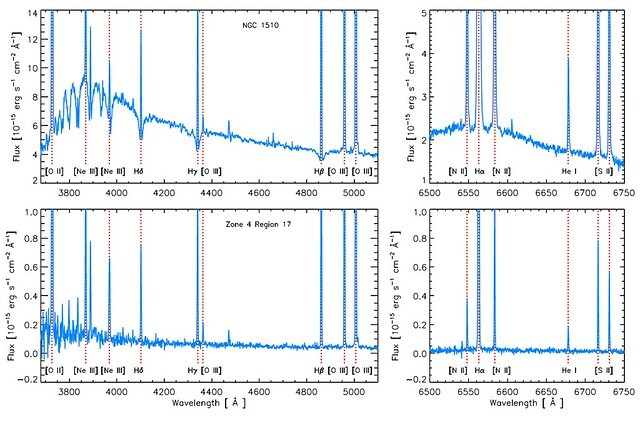 These observations have been used to map the diffuse interstellar medium within the LMC nearby the supernova. Figure 7. The light echo of supernova 1987A. When supernova 1987A was seen to explode in the Large Magellanic Cloud, the Milky Way’s nearest companion galaxy, the brilliant flash of light from the self-destructing star had taken about 170,000 years to arrive at the telescope. Some light was deflected by two sheets of dust near the supernova, and is seen after the star has faded away because the reflected light covers a longer path to reach us. The dust responsible for the rings seen here lies in two distinct sheets, about 470 and 1300 light years from the supernova, close to our line of sight to it. The colour picture was made by photographically subtracting negative and positive images of plates of the region taken before and after the supernova appeared. The only major difference between them is the light echo itself. 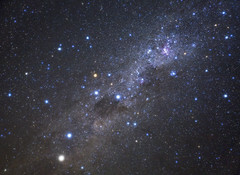 However, the bright stars do not cancel perfectly and appear black, while in other, bright parts of the image, the photographic noise does not cancel either. Despite this the image is an accurate reproduction of the colour of the extremely faint light echo, which in turn reflects the yellow colour of the supernova when it was at its brightest, in May, 1987. 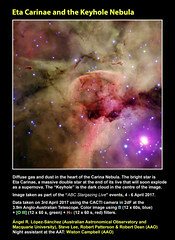 Photo and text credit: David Malin (AAO). In 2011, observations using the infrared Herschel Space Observatory (European Space Agency) indicated that SN 1987A released between 160,000 and 230,000 Earth masses (~0.4 to 0.7 solar masses) of fresh dust into the interstellar medium. Contrary to previously thought, this suggests that supernovae may have produced much of the dust in the very early Universe, as old red giant stars (that are thought are the main producers of dust in the local Universe) did not exist then. 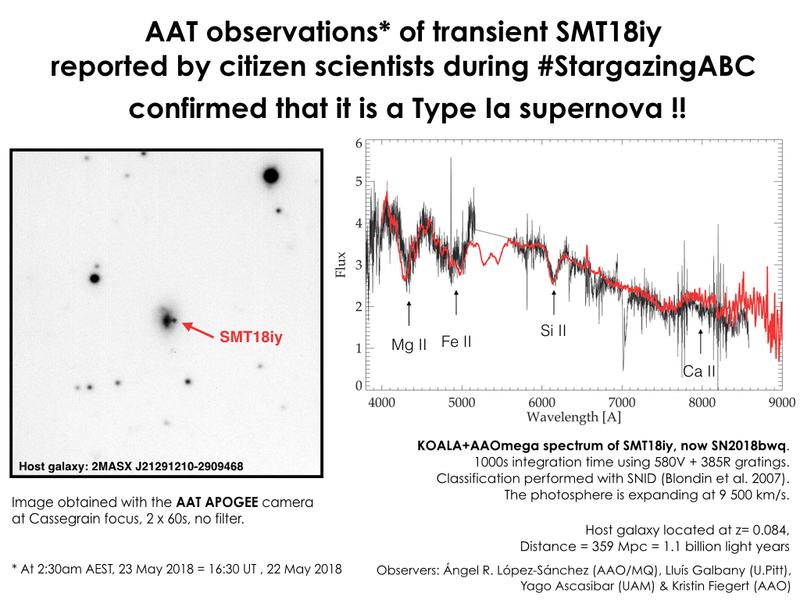 Recent observations using the Atacama Large Millimeter/submillimeter Array (ALMA) telescope confirmed that SN 1987A freshly formed dust. 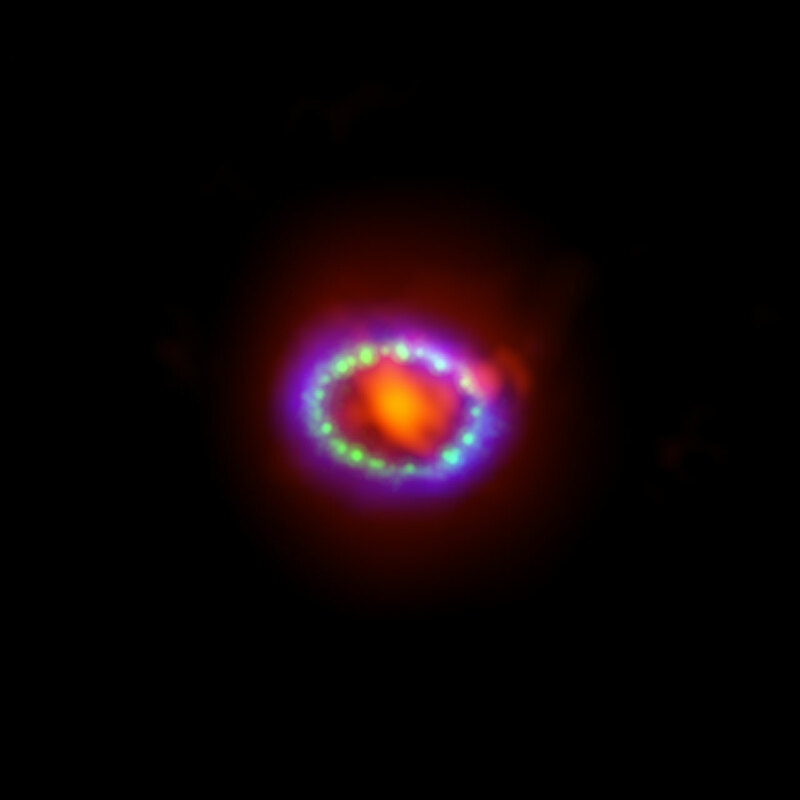 Figure 8 shows a colour image of the remnant combining ALMA data (red) showing the newly formed dust, optical HST image (green) and X-ray Chandra data (blue) showing where the expanding shock wave is colliding with a ring of material around the supernova. The ALMA observations suggest that the SN 1987A remnant now contains about 25 percent the mass of the Sun in newly formed dust, including significant amounts of carbon monoxide and silicon monoxide. 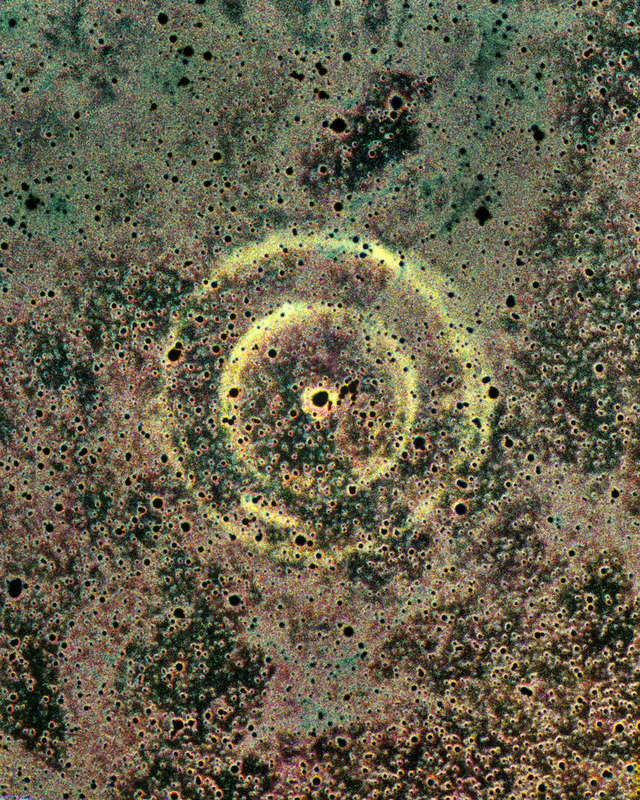 Figure 8: This image shows the remnant of Supernova 1987A seen in light of very different wavelengths. 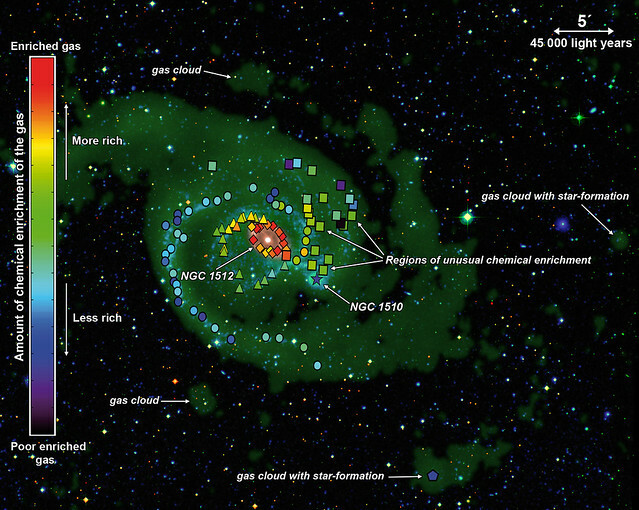 ALMA data (in red) shows newly formed dust in the centre of the remnant. Hubble (in green) and Chandra (in blue) data show where the expanding shock wave is colliding with a ring of material around the supernova. This ring was initially lit up by the ultraviolet flash from the original explosion, but over the past few years the ring material has brightened considerably as it collides with the expanding shockwave. Credit: ALMA (ESO/NAOJ/NRAO)/A. Angelich. Visible light image: the NASA/ESA Hubble Space Telescope. X-Ray image: The NASA Chandra X-Ray Observatory. Approximately two to three hours before the visible light from SN 1987A reached Earth, a burst of neutrinos was observed at three separate neutrino observatories. 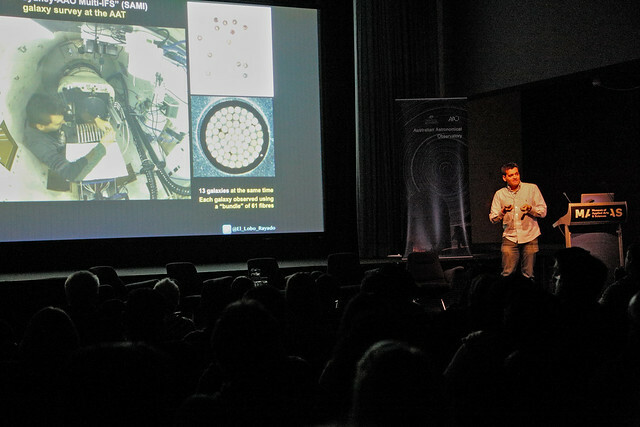 In total 25 neutrinos were detected during this event: 12 recorded in Kamiokande II observatory (Japan), 8 found with the IMB (Irvine–Michigan–Brookhaven) detector (U.S.), and 5 detected by Russian Baksan Neutrino Observatory. Detecting 25 neutrinos in a very short lapse of time was a significant increase from the previously observed background level. Indeed, soon it was clear that the neutrinos were actually emitted from SN 1987A. The neutrino emission occurs simultaneously with core collapse, but preceding the emission of visible light. Transmission of visible light is a slower process that occurs only after the shock wave reaches the stellar surface. This was the first time neutrinos from a supernova were observed directly. The most important implication of this observation was the confirmation of the hydrodynamic core collapse of the massive star. Indeed, these observations were consistent with theoretical supernova models in which 99% of the energy of the collapse is radiated away in the form of neutrinos. The analysis also suggested that the star collapsed into a neutron star but not further collapse to a black hole occurred. However, till date, the predicted neutron stars has not been detected in SN 1987A. The detection of neutrinos from the explosion of SN 1987A marked the beginning of neutrino astronomy. As all the neutrino observatories were located in the northern hemisphere, this meant that the detected neutrinos were found after passage through the Earth. Masatoshi Koshiba was awarded the Nobel Prize in 2002 in recognition for the first detection of neutrinos from a celestial object other than the Sun. The 2002 Nobel Prize in Physics was shared with Riccardo Giacconi for X-ray astronomy and Raymond Davis Jr. for solar neutrinos. 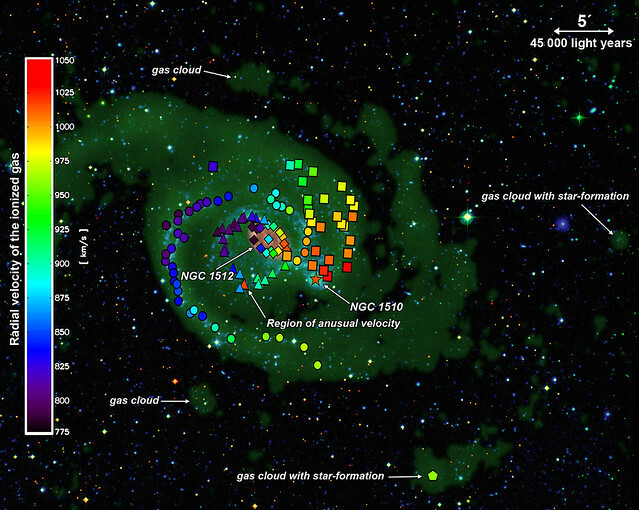 30 years after the explosion, the remnants of the SN 1987A are still monitored in all wavelengths. An optical spectrum of the object will reveal a very prominent emission coming from ionized hydrogen (H-alpha). This feature is also seen using narrow-band images, as SN 1987A appears as a small “pink” blob. 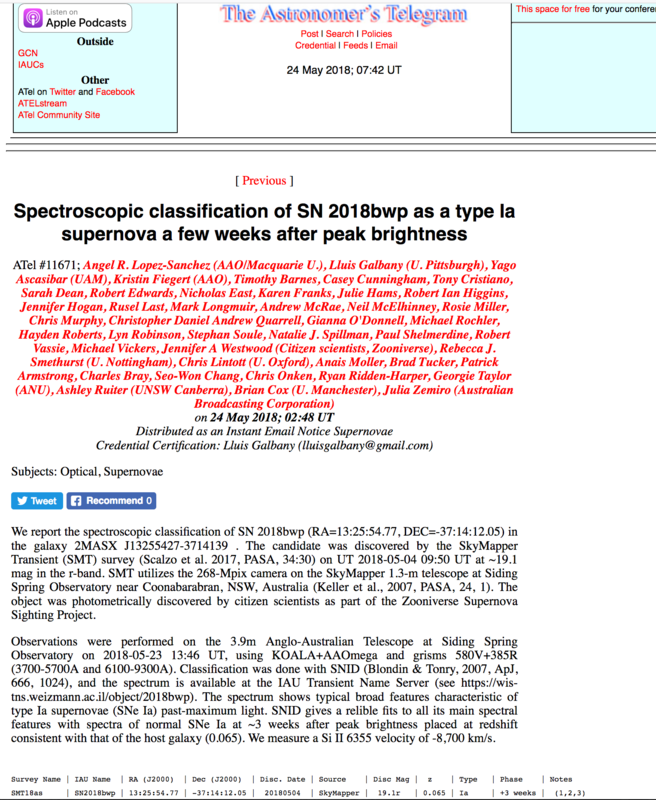 Figure 9 shows as example the optical spectrum of SN 1987A obtained in March 2016 by the Global Jet Watch project. Figure 9. 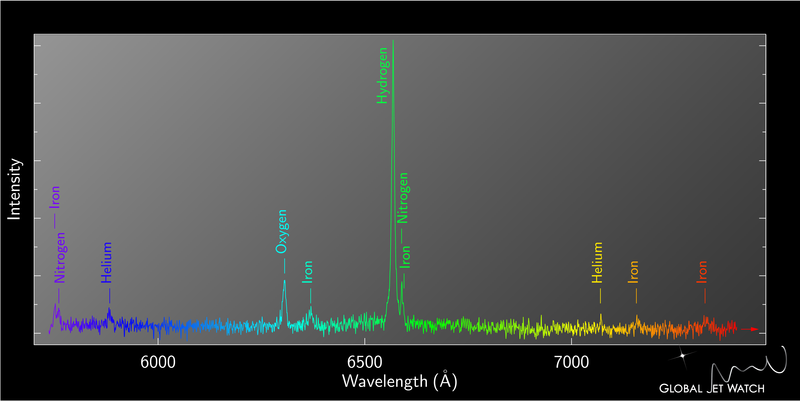 Optical spectrum of the remnant of the SN 1987A obtained using a 0.5m telescope of the Global Jet Watch project. It is a single 3000 seconds exposure obtained in March 2016 as part of a sequence that have been taken to monitor changes in this object. Credit: Global Jet Watch project, http://www.globaljetwatch.net, Acknowledgment: Katherine Blundell (Oxford Un.) 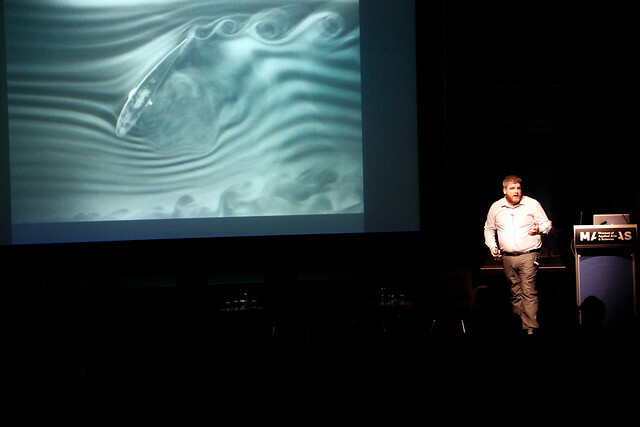 and Steve Lee (AAO). What does the neighborhood around Supernova 1987A look like today? The surroundings of the SN 1987A remnant is filled by clouds of diffuse gas and dust. There are also some nearby bright blue stars that have an age of around 12 million years. These stars are from the same generation of stars that created Sanduleak -69° 202, the star that exploded as SN 1987A. 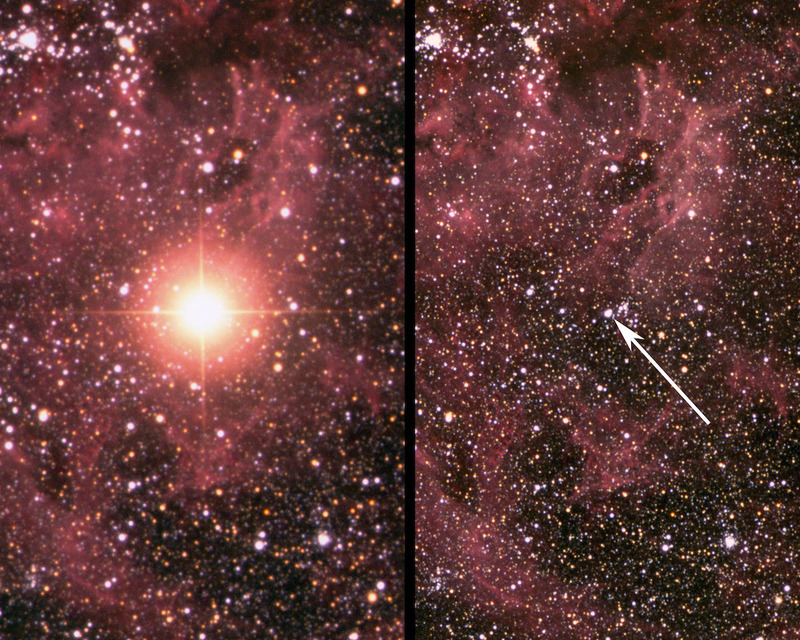 The light of many of these massive stars makes shine the diffuse surrounding gas, that glows with green and red colors as seen in Figure 10. 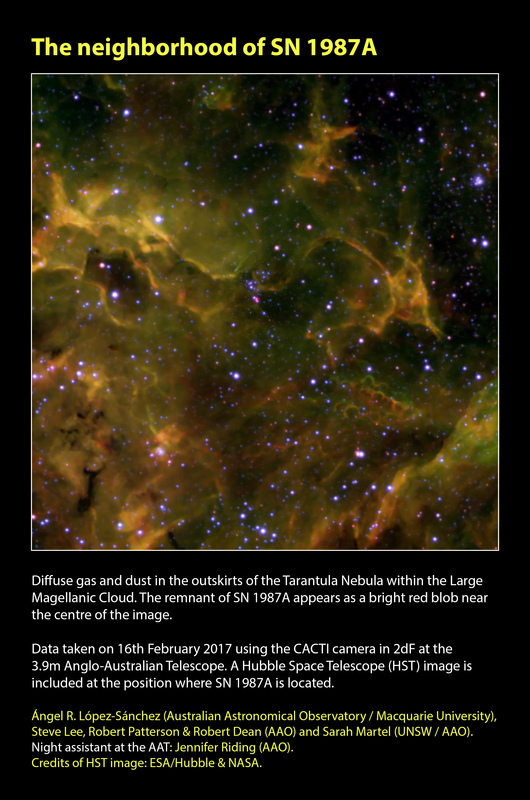 Figure 10: New CACTI AAT image of the neighborhood of SN1987A Diffuse gas and dust in the outskirts of the Tarantula Nebula within the Large Magellanic Cloud. The remnant of SN 1987A appears as a bright red blob near the centre of the image. Data taken on 16th February 2017 using the CACTI camera in 2dF at the 3.9m Anglo-Australian Telescope. Color image using B (6 x 40s, blue) + V (4 x 30 s, yellow) + [O III] (4 x 180 s, green) + Ha (4 x 180 s, red) filters. A Hubble Space Telescope (HST) image is included as luminosity at the position where SN 1987A is located. 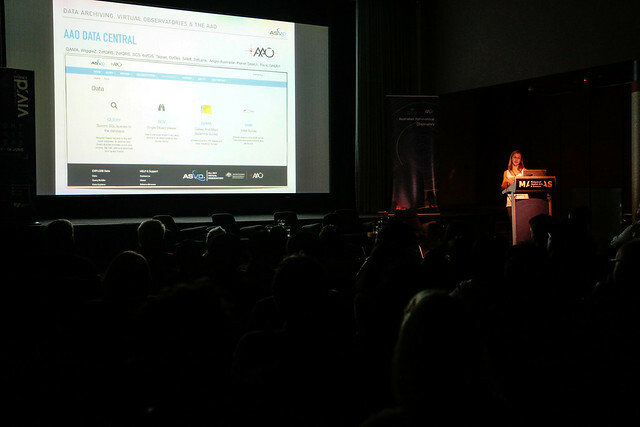 Credit: Ángel R. López-Sánchez (AAO/MQU), Steve Lee, Robert Patterson, Robert Dean and Jennifer Riding (AAO) & Sarah Martel (UNSW / AAO). The image, obtained on 16th February 2017 using the CACTI auxiliary camera of the Anglo-Australian Telescope (AAT), shows the remnant of Supernova 1987A, with the pink glow of its hydrogen gas, and filaments of gas and dust that stretch over 300 light years to either side. 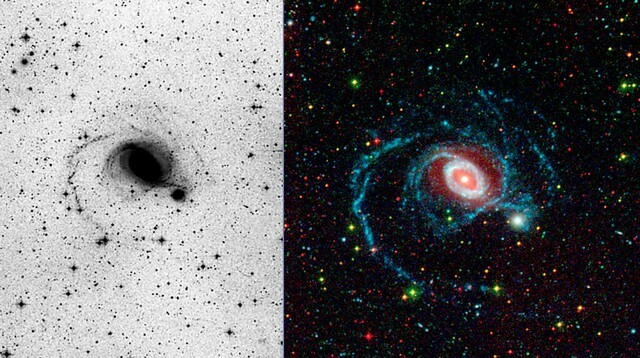 A comparison of this AAT image with those obtained by the Hubble Space Telescope is included in Figure 11. An animation showing the zooming into the remnants of the SN 1987A and also including the famous AAT view of the Tarantula Nebula obtained by David Malin (AAO) before the explosion is also available. 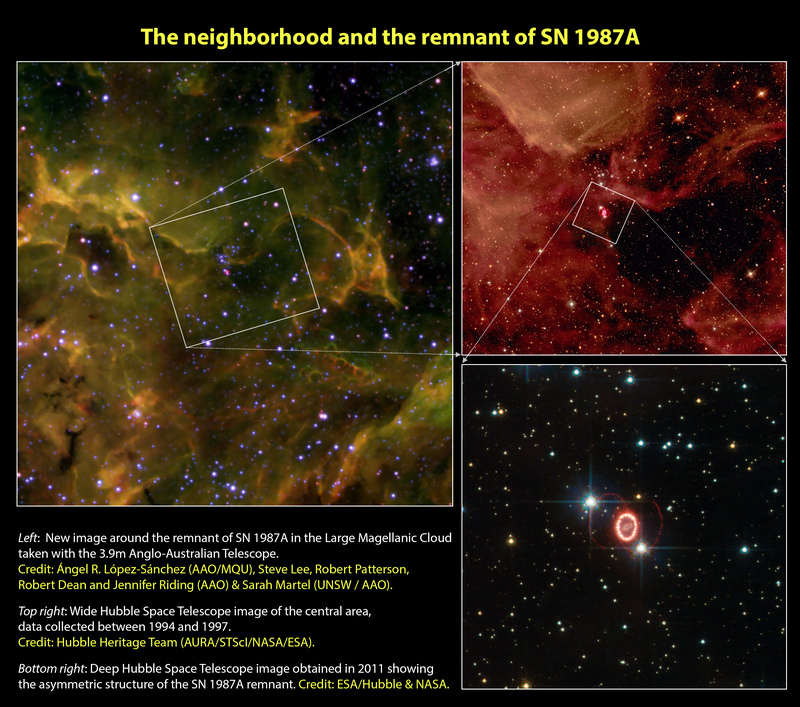 Figure 11: The neighborhood and the remnant of SN 1987A. Left: New image around the remnant of SN 1987A in the Large Magellanic Cloud taken with the 3.9m Anglo-Australian Telescope. 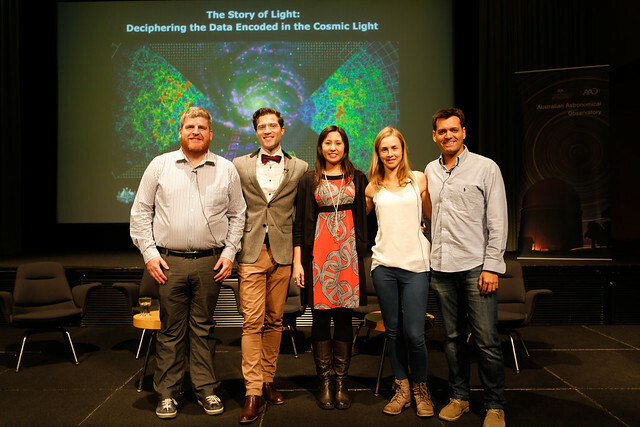 Credit: Ángel R. López-Sánchez (AAO/MQU), Steve Lee, Robert Patterson, Robert Dean and Jennifer Riding (AAO) & Sarah Martel (UNSW / AAO).Top right: Wide Hubble Space Telescope image of the central area, data collected between 1994 and 1997. Credit: Hubble Heritage Team (AURA/STScI/NASA/ESA). Bottom right: Deep Hubble Space Telescope image obtained in 2011 showing the asymmetric structure of the SN 1987A remnant. Credit: ESA/Hubble & NASA. The peculiar shapes of the gas and the dust also indicate that, previously to SN 1987A, many other stars have ended their lives as supernovae. In any case, there are also indications of new star forming now within these clouds. The new image also reveals a group of pearl-like bubbles, 110 light years away from the explosion site. These bubbles are a sign of youth, indicating previous supernova explosions in this fertile nursery, that still is forming stars. Who knows, perhaps this region gives us more celestial fireworks soon. Animation: Zooming into the SN 1987A remnant. This 40 seconds animation shows a zooming into the SN1987A remnant in the Large Magellanic Cloud. 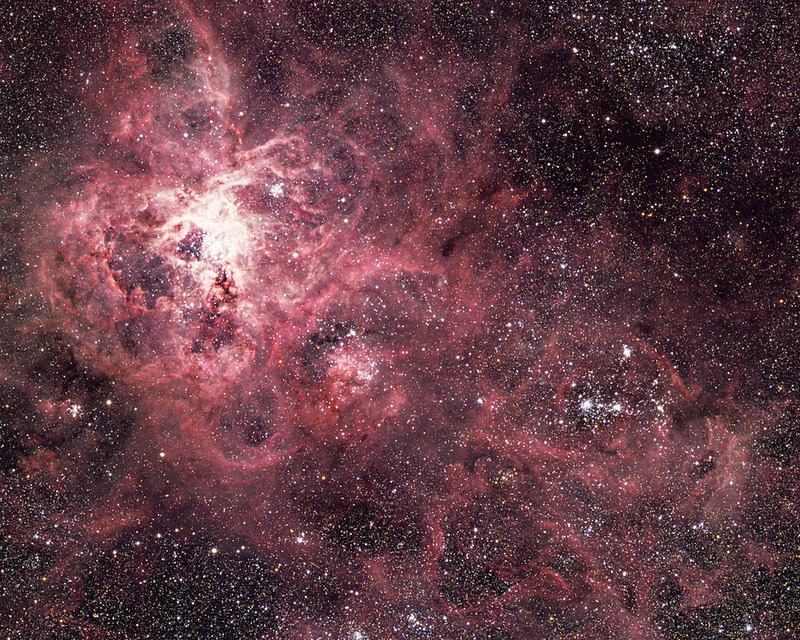 It compiles 4 images: the full view of the Tarantula Nebula, as seen by the AAT years before the explosion on 23 February 1987, a new image of the neighborhood of the supernova obtained with the new CACTI camera at the AAT, and wide and deep images obtained with the Hubble Space Telescope showing the asymmetry of the SN 1987A remnant. Credit: Australian Astronomical Observatory. Credit of the composition: Ángel R. López-Sánchez (AAO/MQU). Credit of the individual images: Tarantula Nebula with the AAT: David Malin (AAO), CACTI image with the AAT: Credit: Ángel R. López-Sánchez (AAO/MQU), Steve Lee, Robert Patterson, Robert Dean and Jennifer Riding (AAO) & Sarah Martel (UNSW / AAO), Wide Hubble Space Telescope image: WFPC2, Hubble Heritage Team (AURA/STScI/NASA/ESA), Deep Hubble Space Telescope image: ACS, ESA/Hubble & NASA. (1) The Tarantula nebula (also known as 30 Doradus and NGC 2070) is a massive star-forming region within the LMC that sprawls across more than 2000 light years. This nebula hosts the open clusters R136 and Hodge 301. This clusters contain some of the largest, brightest and most massive stars known, including some that are very likely to explode soon as supernova. (2) Stars that are more massive than 8 solar masses end their lives as Type II supernova. The star first burned hydrogen (H) into helium (He) in its core. Later the He itself is burned, producing a smaller core of oxygen (O) and carbon (C). As the core contracts and heats to high temperatures, carbon and oxygen are also ignited. Their fusion produces neon (Ne), magnesium (Mg), silicon (Si), and sulfur (S). Finally a core of silicon and sulfur produces iron (Fe) and nickel (Ni). The internal structure of such stars resembles an onion, with deeper shells burning heavier elements, until a central core of iron is created. However it is impossible to produce nuclear fusions with iron. As the core colds down, the gravitational pressure of the rest of the star make the material collapse towards the core. This implosion is so violent that is generates an enormous burst of energy that rebounds as neutrinos back outward and blows the star apart as a supernova. 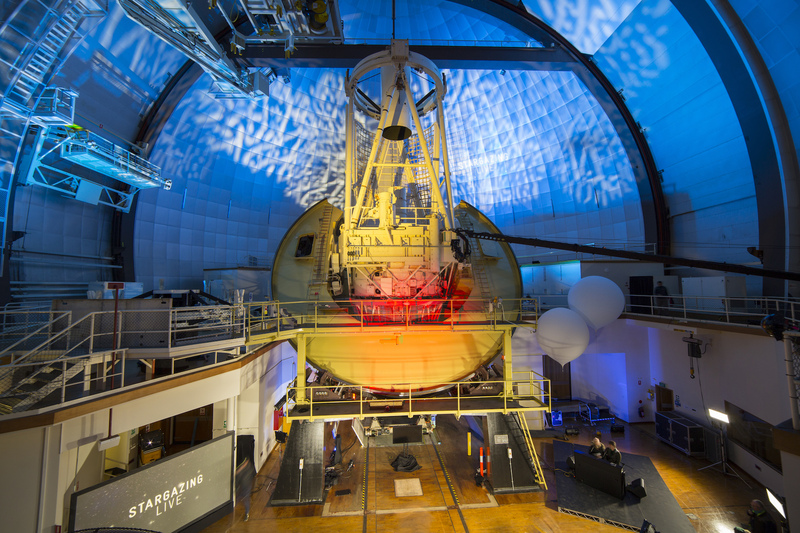 Last Thursday 24th November I conducted an outreach exercise while supporting astronomical observations at the Anglo-Australian Telescope (AAT). 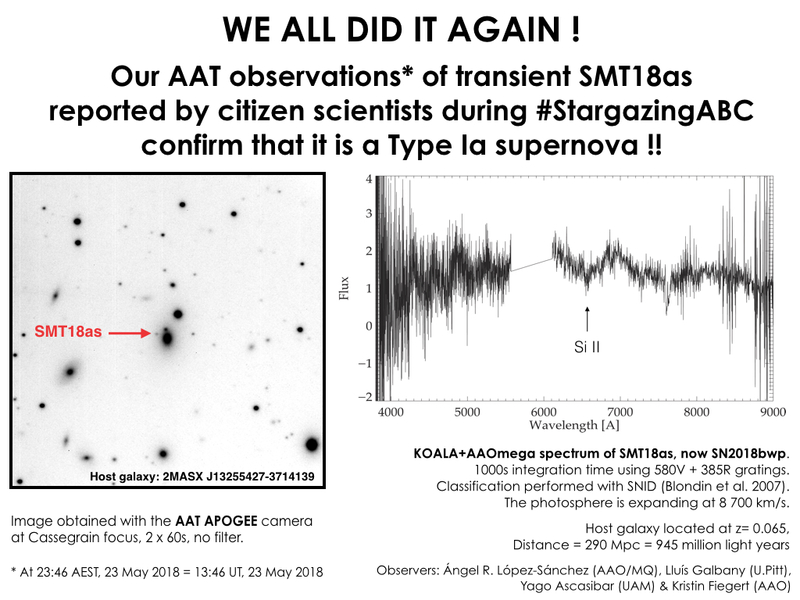 Using the Australian Astronomical Observatory (AAO) Twitter account I asked people to chose one of 4 given object located in the Large Magellanic Cloud (LMC) to be observed at the telescope with the new CACTI camera while we were changing gratings of the scientific instrument, the spectrograph AAOmega. I’ve called the experiment “LMC Little Gems using CACTI”. We got 193 votes, thank you to all of you who voted and also shared the post! 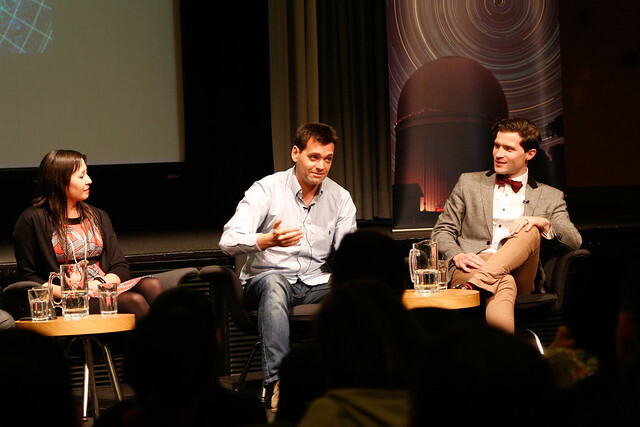 It was quite exciting, particularly the last 30 minutes when, thanks to some of the best science communicators in Spain (and friends), we got +50 votes! I must say my favorite was NGC 1949, but NGC 2018 was also a nice choice. 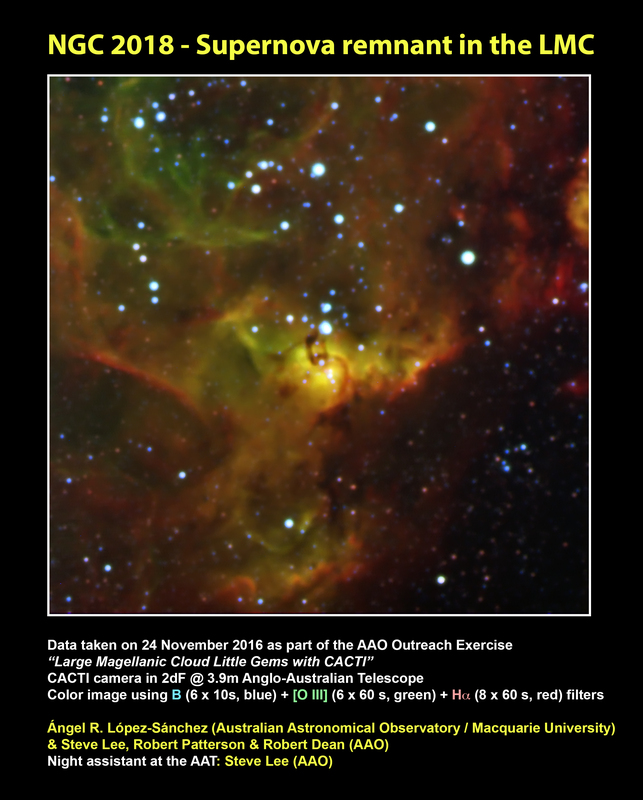 NGC 2018, a supernova remnant in the LMC Data taken on 24 November 2016 as part of the AAO Outreach Exercise “Large Magellanic Cloud Little Gems with CACTI”. 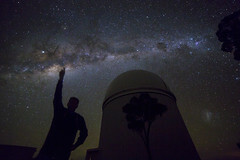 CACTI camera in 2dF @ 3.9m Anglo-Australian Telescope. Color image using B (6 x 10s, blue) + [O III] (6 x 60 s, green) + Ha (8 x 60 s, red) filters. A high resolution image can be obtained here. Credit: Ángel R. López-Sánchez (Australian Astronomical Observatory / Macquarie University) & Steve Lee, Robert Patterson & Robert Dean (AAO) Night assistant at the AAT: Steve Lee (AAO). I’ve doing a bit of searching to get some extra information about this object. Indeed, the Large Magellanic Cloud has a high star-formation activity, meaning that star-cluster, star-forming nebula but also supernova remnants are all around the place. 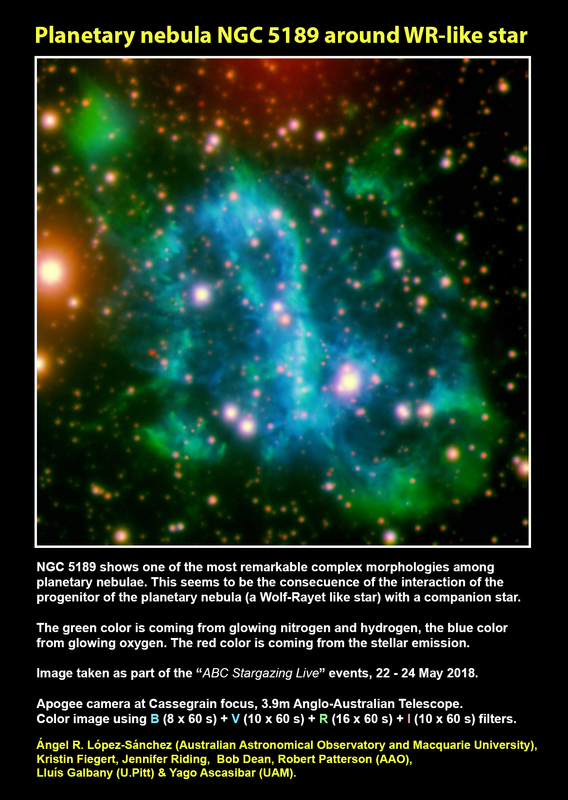 However, SIMBAD defines NGC 2018 as Association of Stars, and few references to this object to be a supernova remnant are found (e.g., here). But looking at the image I can say that this definitively is a supernova remnant, yes, with an associated star cluster too (very probably, the sisters of the massive star that exploded as supernova). How? Well, do you see the filament structure seen in the green colour, that traces the [O III] emission? That is related to a supernova explosion, these features are usually not found in star-forming regions… unless you have a recent supernova explosion, as it is this case! Thank you very much to all that participated on this outreach exercise! I really hope I can organize another experiment like this sooner than later!